So, wait. How many more wins do Arsenal need? A million? There are 12 games remaining in the league and, let's face it, probably one left in Europe. 13 chances to put the grimness of the last week behind us, to scratch and claw up to that sweet, sweet Top Four Trophy. Mathematically speaking, Arsenal's odds of finishing fourth or higher are currently 48.5%. To be perfectly realistic, Arsenal probably need to win eight or nine of the remaining 12 games, seven if they're lucky and the others drop points. Can you look at the remaining schedule and point to eight winnable games? There are certainly three that are the diciest: Spurs away, Everton at home, and United at home. That leaves nine: Villa at home, Swansea away, Reading at home, West Brom away, Norwich at home, Fulham away, QPR away, Wigan at home, and Newcastle away. Next week's North London derby is the big one, a Top Four six-pointer. Arsenal will play Everton at the Emirates sometime thereafter (depending on Everton's advancement in the cup.) Winning those two will make the job easier against the rest of their opponents. But for now, failing to pick up all three points at home against relegation threatened Aston Villa would be like shooting yourself in the foot right before running a marathon. slowly towards you. Wait, they've just conceded a goal. That isn't intimidating at all! Carl Jenkinson returns from the one match ban he received for being sent off at Sunderland, and that's good news, because the bad news is that Bacary Sagna is out. The blond-braided Frenchman tweaked his knee against Bayern and will sit out this contest, meaning Jenkinson will get a chance to redeem himself tomorrow. Meanwhile, Nacho Monreal returns to the side, having been cup tied from participating in the Champions League. That means Arsene Wenger will choose between Thomas Vermaelen, Laurent Koscielny, and Per Mertesacker for the center back pairing. It'll be a challenge for the back four not to get too complacent in possession, as Villa have the players to counterattack. The squad news in midfield and up front is fairly quiet; it seems like everyone ahead of the banged up back four is available for selection, fingers crossed. Wenger said, when announcing Sagna's injury, "I don't think there are any other knocks really." Predicted XI: Szczesny, Jenkinson, Vermaelen, Mertesacker, Monreal, Arteta, Wilshere, Cazorla, Podolski, Walcott, Giroud. Oh, are Villa gonna be wearing these horrible colors? that are this color... I won't wear them on Saturday. From what I've read online, Villa fans seriously think they can steal at least a point from this one, and I wouldn't blame them. They've slightly turned a corner, having finally won again against West Ham after previously blowing a 3-1 lead against Everton the week before. Villa are still without Chris Herd and Marc Albrighton, both out with foot injuries. Gary Gardner is out of the season with a knee injury. Richard Dunne has not played a game this season with a groin injury; he's already had surgery three times. Stiliyan Petrov remains sidelined with acute leukemia. There are doubts over Charles N'Zogbia (knee) and Gabriel Agbonlahor (illness), compounded by the fact that Aston Villa have not played a match in two weeks. Agbonlahor missed the West Ham match (and as such, has not played since February 2.) N'Zogbia was subbed off after 85 minutes against West Ham, after scoring to put Villa ahead 2-0.
against West Ham that could only be called "Gervinho-esque." Over the course of four days, from Saturday to Tuesday, Arsenal lost twice at the Emirates. While Bayern Munich are far and away among the best teams in Europe at the moment (and now, Champions League favorites after Barcelona's first leg loss at the San Siro,) Blackburn Rovers are certainly not of that same quality. Gooners are all left standing about wondering what the hell is going on, while looking for pantomime villains to blame. Quite honestly, I still blame Denilson. The thing about Arsenal's two home losses is that it's the first time it has happened (consecutive home losses across all competitions, that is) since November of 2010, when Arsenal lost to Newcastle and *vomit* Tottenham Hotspur. You may find yourself wondering, then, when was the last time Arsenal lost three straight home games? It was October-November of 2002, when Arsenal lost 2-1 to Auxerre in the Champions League, then 2-1 to Blackburn Rovers in the league, then 3-2 to Sunderland in the League Cup. Aston Villa are teetering on the edge of the relegation zone, sitting just one point above the drop line. Aston Villa (17th) have 24 points, Reading (18th) have 23, Wigan (19th) have 21, and QPR (20th) have just 17. 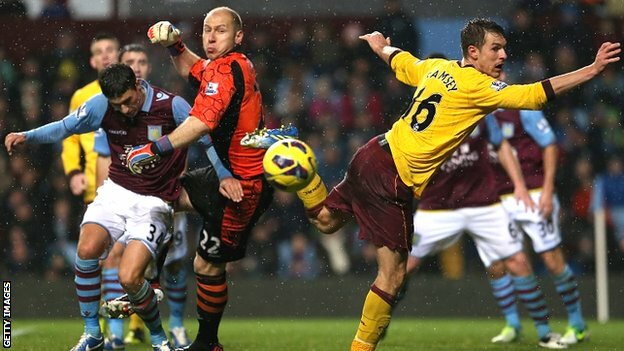 On February 10, Villa beat West Ham 2-1. It was the Villans' first victory in the league since December 15. A week after that, Villa lost 8-0 at Chelsea, then 4-0 to Spurs, then 3-0 to Wigan, tumbling them from 14th to 17th place. 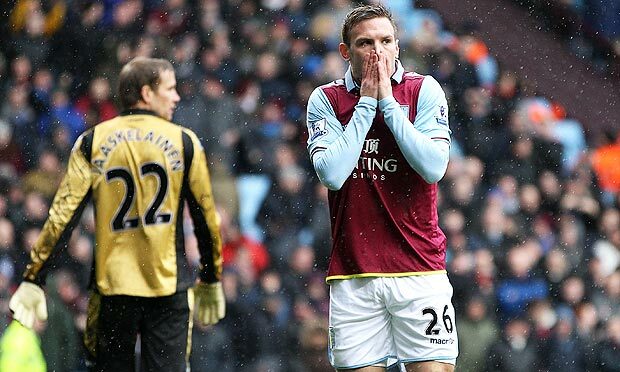 Before the West Ham win, Villa had gone eight without a victory, including five losses. In the meantime, they were bounced from the FA Cup by a Championship side and from the League Cup by Bradford City. Actually, that all sounds quite familiar. exciting happening in that game. Arsenal won all three meetings with Aston Villa last season, but earlier this year, played a miserable 0-0 draw in the pouring rain in Birmingham at the end of November. It was a dire affair, in which Arsenal never really looked capable of moving the ball around with gusto because of the conditions. It also came just shortly before Villa went through a stretch where they conceded tens of millions of goals to everybody, so Arsenal had to even further be cursing their luck to have played Villa at the wrong time in the wrong conditions. Villa came to the Emirates twice last year, once in the league and once in the FA Cup. That cup tie came first, at the end of January, when Arsenal came back from 2-0 down at halftime to win 3-2. Two of Arsenal's goals came from the penalty spot and all three came within seven minutes of each other. Arsenal had a much easier time in the league encounter at the end of March, winning comfortably 3-0 behind goals by Kieran Gibbs, Theo Walcott, and Mikel Arteta. Of Aston Villa's last four goals scored at the Emirates, three of them were scored by Darren Bent. The referee is West Yorkshire-based Martin Atkinson. This is the first time Arsenal will see Atkinson this year without Chelsea being involved. Chelsea won both games 2-1. Arsenal won two of three with Atkinson last season. I now only have memories of Atkinson being dreadful in the build-up to both Chelsea goals at Stamford Bridge in January, which is, incidentally, the last time Arsenal lost a league game. Bizarrely, Villa have not seen Atkinson at all this season. Last year, Atkinson worked the final match of Villa's season (a 2-0 loss at Norwich.) Earlier in the year, he worked their 0-0 draw with Wolves at Villa Park. Atkinson has shown 108 yellow cards this season, more than any other Select Group official. He has only shown one red card, though, and that came in the Tyne-Wear derby, to Cheick Tiote.